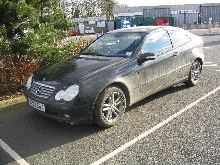 The first-generation CLK was introduced in 1996, 3 years after the 1st generation (W202) C-Class model. The launch of the CLK also marked Mercedes' first foray into the mid-sized coupe market. Less expensive than the sporty SL-Class convertibles, the first generation CLK cabriolet was the most successful convertible Mercedes-Benz ever offered; 41,520 were sold in the United States from 1999 to 2003, and more than 115,000 were sold throughout the world. Versions offered in the first generation were the CLK 200(136 PS), CLK 200 Kompressor(192 PS), CLK 230 Kompressor(193 PS), CLK 320(218 PS), CLK 430(279 PS) and the CLK 55 AMG(347 PS). All were available in both coupé and convertible form. The CLK 320 Coupé was introduced in the 1997 model year, powered by a 3.2 L V6 engine. The CLK 320 Cabriolet and the 4.3 L V8-powered CLK 430 appeared in 1999. 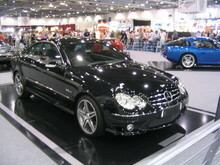 The high-performance CLK 55 AMG, which was introduced first in Europe in 2000, was powered by the "M113" 5.4 L V8 engine. 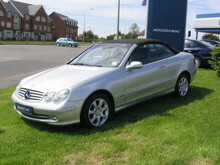 The CLK 55 AMG cabriolet became available in 2002, the last year of this body style.